That’s a great question and one that has been asked over the last five centuries. Ever since they were discovered by explorers of the new world in the 16th century, and brought to other countries they have been enjoyed as pets the world over. So why should you get a guinea pig as a pet? Surely there are other animals that make better pets? 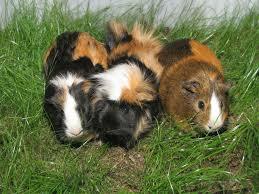 Well read on and find out why guinea pigs are extraordinarily good pets to have around the home. 1. As they are much larger than other small animals that are usually kept as pets, like hamsters and mice, they are a lot easier to catch if they do so happen to escape out of your hands. 2. They are easy to locate. The great thing about them is that although they will often try and find hiding places in your home if they do escape, they wont be able to lodge in places like underneath your sofa of behind sideboards like hamsters and mice can. However that doesn’t mean to say that they wont try and get into inconvenient places. 3. They are well-behaved. Even though they are rodents and like mice and rats, they do enjoy gnawing at things, they are less likely to eat your household furniture. But they do need keeping an eye on and you can’t leave them to run about in your home. Unfortunately guinea pigs can’t be trained in this ray like rabbits can. 4. They are very low maintenance pets and can be left whilst you go off to work or school. They enjoy their own company and don’t require a great deal of attention if you have a group of them as pets. You just have to make sure that they are fed, watered and looked after. However, a lone guinea pig will need a lot more attention. 5. They are very good at bonding with people. This makes them idea companions for elderly people as they are low maintenance but affectionate all the same. They do love to be handled though and will purr nicely if you hold and cuddle them. 6. They are great first pets. Because they are easy to look after they also make great pets for young children to look after. They will require supervision to ensure they are looking after them well and that they handle them in the right way. They are great for children aged 6 and upwards to teach them about responsibility . 7. They love to communicate. They will try and communicate with you using many different sounds sunch as purrs, squeaks and churs. When my guinea pig knows im coming, it squeaks to acknowledge me. They get to know your routines and will start squeaking if they hear you rustling a food back for example, in hope of getting more food. 8. They are real characters. Guinea pigs most unique disctinctive is called ‘popcorning’ which is wehre they will jump and leap up like popcorn when it has been heated up. They do this when they are excited and so are very expressive with their emotions. 9. They are passive animals. The only time they will bite you is when you have made them angry or it thinks your hand is food. They are unable to see directly in front of their noses and so only sense food with their whiskers and nose. 10. They don’t require a great deal of space. Although they should have a good size cage approximately 7.5 square feet for each guinea pig, that is not a lot of space and they can be kept in a large home or a small apartment very easily. 11. The are inexpensive to keep. Once you have purchased a cage and initial bedding, sawdust, food and play toys they just require regular feeding and looking after to ensure they are kept well. Keep them well and they shouldn’t need visits to the vet as well.